The Tiltamax Gravity 3-Axis gimbal is used to stabilize large digital cinema cameras up to 33 lbs (15 kg) via 3-axis motor calibration. The Gravity easily adapts to different environments and shooting requirements. It can be handheld, mounted to a jib, anchored to a camera car, mounted to a suction cup rig, etc. The Gravity comes with our unique Steadicam-inspired lead screw technology. This design assists in the fine-tuning of the balancing of the gimbal, allowing you to find the ideal balance in no time. There is also a unique auto calibration system installed, which automatically goes through each axis to find the best settings for your rig in seconds. The Gravity guarantees the best performance with no system crashing or drifting. The package comes complete with an elegantly designed power solution system that can allow an operator to monitor the power supply of the gimbal during shooting. Multiple voltage persistent outputs are built-in so you can power different equipment at the same time such as a wireless follow focus, monitor, wireless video transmission, etc. The Gravity was also designed with internal power and SDI video cables for a neat, clean profile. The gimbal is very lightweight and extremely versatile. 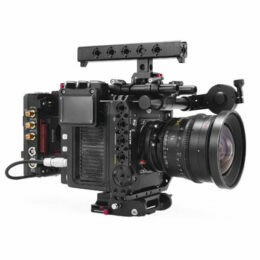 Cameras that can be flown on the Gravity include (but are not limited to): Red DSMC2, Sony F55, Sony FS7, Arri Alexa Mini, Canon C200/300 Mark II, and more. A wireless connection allows for the remote control of the gimbal via the Mimic system (included in the package), the 1A Tools Alpha Wheels, the Futaba joystick controller, and more. When paired with the Nucleus-M handles (which can be mounted to the Gravity in place of the regular handles), you can control your own focus, iris, and zoom from your fingertips. Additionally the Armor Man 2.0 was designed for the Gravity allowing for enhanced operator endurance and flexibility while filming for long periods without compromising gimbal performance. The Gravity also comes Tiltamax Assistant app ready so that you can control a multitude of different settings for each of the motors individually to customize your setup as you see fit.